David’s book, The Church of 80% Sincerity, released by Penguin Books, has been heralded as a book that could head right to the top. It is a delightfully humorous look at his life as he meets the challenges of living life with a facial difference. David was born with a facial disfigurement called Cavernous Hemangioma (a benign tumor consisting of blood vessels), David calls his face “a gift from God. He is quick to add that it is one of those gifts where you say “Gee, you really shouldn’t have.” David talks about life’s experiences and his moments of grace — those few minutes in a lifetime that you can truly say, “Life is Great”. David captures several to share with his audience in his presentation. David is a veteran of San Francisco’s prestigious Solo Mio Festival and was featured on the PBS presentation of Able to Laugh. 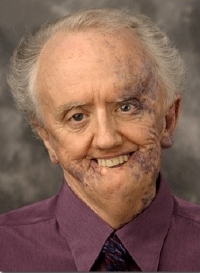 His accomplished acting and speaking skills add to the ingenious humor and favorite stories of growing up and maturing with a visual disfigurement that would have encouraged many to stop in their tracks at a very young age. Roche however, chose to meet the challenges and honed his acting craft in order to talk about his disability. Hearing David as he presents his dramatic yet humorous presentation, allows the audience to share in the agony of public ridicule, the fear of insecurity, and the joys of discovering one’s self-worth. His message has been heard throughout the United States, Canada, Australia, and Europe. He has been recognized by corporate America and campuses across the country as a presenter who has attitude. His compassion extends beyond the stage into the community: he is co-founder of San Francisco’s Childcare Switchboard/Single Parent Resource Center, the California Pacific Medical Center message therapy intern program, and recipient of the World Burn Congress Medal of Honor and the Marin County Martin Luther King Diversity Award.